Nice win by UW - Noah Dickerson gets a double-double. The following is the most interesting part of the article in my opinion - and the fact that Michigan dropped 10 places after losing to Michigan State at home. 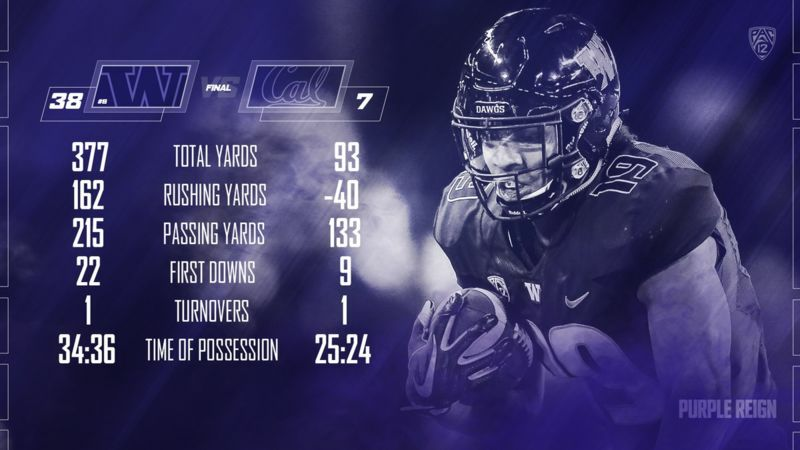 The Washington Huskies improve to 6-0 with a dominating performance over the California Bears last night at Montlake. I&apos;m enjoying the late games this year - not sure I would if I were attending the games but being able to watch them at home after the rest of the games are over and I&apos;ve gotten some things done around the house has been a nice change. 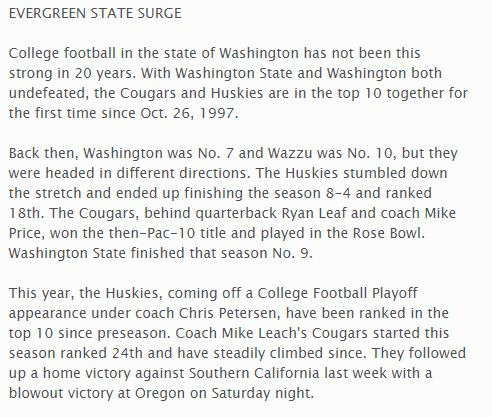 They started fast and kept going to the end - they did slow down in the 3rd quarter but in the end the #5 Huskies were fairly dominate in their win over the #23 Washington State Cougars in what may have been the most important Apple Cup ever. The Huskies are Pac-12 North Champions - congrats! Their schedule isn't going to help thim with the playoff selection committee - I expect Ohio State to replace Texas A&M at the 4 spot. Can't wait to keep this run going!